Last night I visited BRGR.CO in Soho. I knew the name rang a bell but I couldn’t think why but it all became apparent as it came into view as I walked up Wardour Street. BRGR.CO used to be a Jerk Chicken restaurant, famous for being one of Amy Winehouse’s favourite Jamaican restaurants in London. I even visited last year, although I wasn’t overly impressed and there were hardly any other diners joining us, despite it being a Friday evening. This time I visited on a Thursday and BRGR.CO was packed to the rafters. I was with two others and we snagged a table in the back room. I don’t usually read other people’s reviews before I go and try out a restaurant but on this particular occasion I couldn’t resist. I read a review by a well known London food blogger and as a result didn’t have high hopes – this blogger hadn’t exactly been complimentary about the restaurant and compared it to a plethora of burger joints that have opened in the capital over the last few years, which I don’t think you can do. The waiter came over to explain the concept and already I was surprised, in a good way, to hear that this experience might just be a little bit different to other burger restaurants that I have enjoyed recently. He explained that the chefs only use the finest cuts of 28-day aged beef from the Duke of Buccleuch Estate in South West Scotland and they come in three sizes – 4oz, 6oz and 8oz. I am on a wheat free streak at the moment so opted for the bun free 8oz ‘Steak BRGR’ (£13.95), which is a cut ground steak patty with crunchy fries and the savvy wedge salad. Jack and our friend opted for an 8oz ‘Masterpiece’ (£8.95) each with extra toppings. Mine arrived on a boring white plate and presentation was so poor in comparison to the other two burgers that arrived on trays lined with stripey paper. But I could see past the bad presentation when I placed the first mouthful of burger in my mouth. The medium rare meat flaked away from the patty and I was in heaven. Soft, melt in mouth beef took over my palate and I kept going pretty quickly until it was all gone. The boys did exactly the same and soon we were almost licking the last morsels off the plates. The only criticisms from the boys were that the bottom of the burger bun was too soggy and the paper underneath the chips split and made it slightly difficult to eat the chips without also consuming the paper. It wouldn’t be right for me to write this post without mentioning the music. Last night a DJ saved my life was humming away in the background when I arrived but gradually the music drifted towards acid house and 90s house music with Voo Doo Ray and LFO blaring out of the speakers. 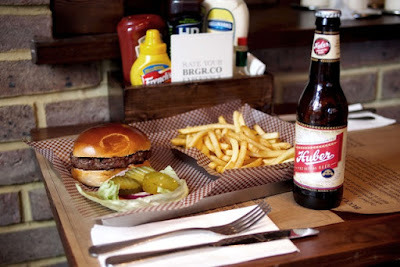 BRGR.CO has followed the current industrial trend with the design, which is not a bad thing by any means. The lighting creates a great atmosphere and the white tiles complimented the dark oak furniture. I loved it. The boys enjoyed a milkshake after the burger and regretted it soon afterwards. Not because it wasn’t delicious (because I’m assured it was), but because they were almost too full to walk out of the restaurant. After eating an 8oz burger and chips, a milkshake to share would definitely have sufficed! We took a vote as we left and asked ourselves if we would go back again. The answer was a resounding yes and we even sent our friends there this evening. I’m slightly jealous.